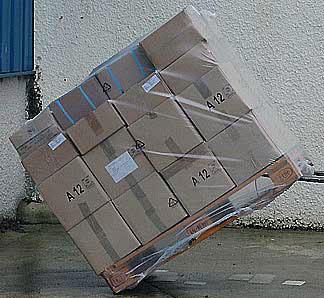 Heavy Duty Shrink Pallet Bags will secure your products even when the pallet is tipped. 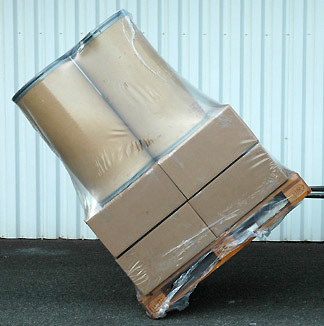 Giant Pallet Wrap Shrink Bags will secure and protect your products on a pallet. 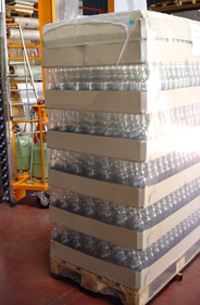 We have 4 mil and 5 mil clear Shrink Bags available for immediate shipping. Poly Shrink Bags will also protect your products from dirt, dust, grime and moisture. Manufactured from high quality shrink bundling film. We custom manufacture Giant Shrink bags in other gauges and sizes. Lowest minimum on custom sizes available anywhere. Call today with your requirements. Shrink pallet size shrink bags in 2 minutes or less! Paletas Tamaño Bolsas Retráctiles, Gigante Poly bolsas retráctiles, Pallet bolsas retráctiles, giant shrink bags, pallet size shrink wrap bags.